Good Music is down the familiar black and white striped staircase of the Black Market on Queen Street, where I can already hear the early 80s punk music blasting over the sound system. It's been years since my last visit but the smell and sounds haven't changed. UPDATE: Good Music has moved to Dundas West . 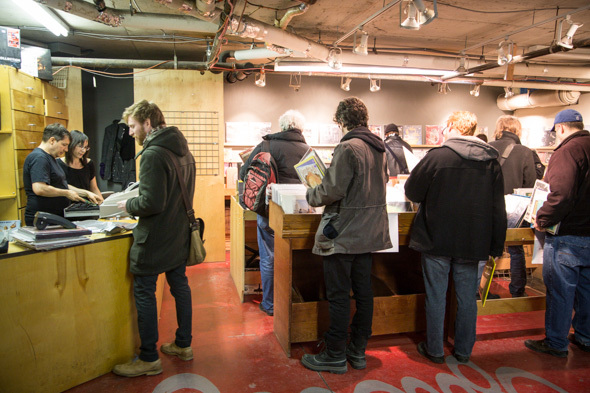 You can now find Shortstack Records in he Black Market space. 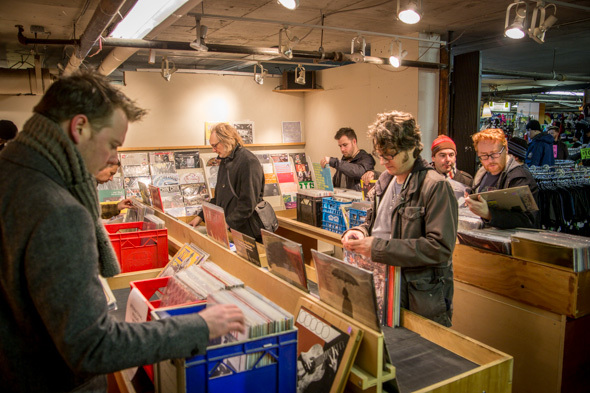 One thing that has changed is the small, brightly-lit record shop that opened its gate for the first time at 11:30am this Saturday. Blank white walls hold wooden shelves that protrude out into the already limited floor space in this... alcove - for lack of a better term. Good Music is officially open in the Black Market. I immediately notice two Bonnie 'Prince' Billy records on display and begin a slow lap around the shop. The albums that aren't being stored in milk crates appear to be put on the shelves in random order, with Things Fall Apart by The Roots just two spaces down from Five Leaves Left by Nick Drake . Up the middle aisle is an impressive collection of 70s Japanese pressings of The Beatles , later confirmed to be the oldest records in the shop. Behind the counter is the owner, Lincoln Stewart - a man vinyl aficionados might recognize from Vortex Records . He takes me on a little tour of his collection as we chat. He begins picking records out of crates, explaining how he sold a Kitty Wells record from the 60s already that morning. 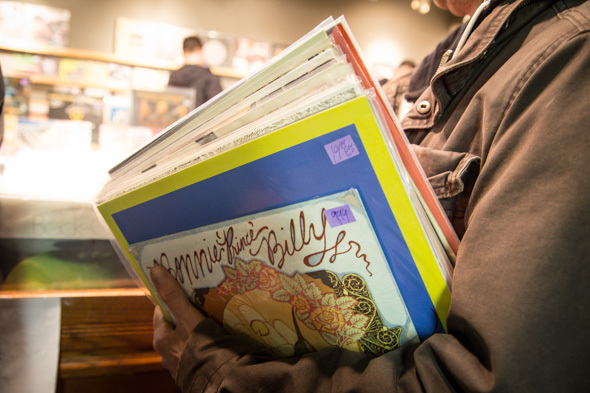 The shop boasts a collection of perfect quality vinyl, and Lincoln holds his merchandise to the highest standard. He runs a mailing list where applicants get first dibs on any new stock he brings in, and he also will be doing special orders out of this new Queen Street location. 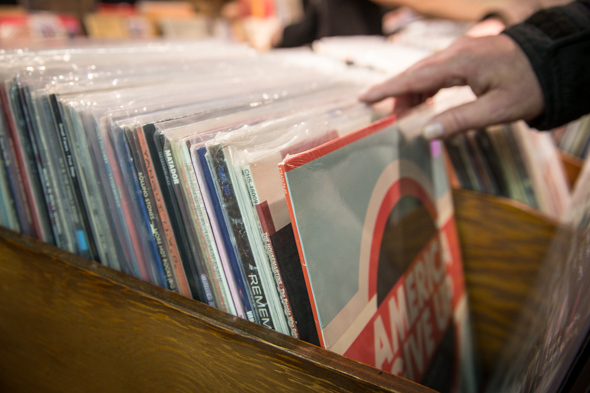 The records are very reasonably priced and Lincoln works hard to find rare micropressings. He points to a new record that he claims is very popular in all stores, but slyly adds he went out of his way to get the red vinyl version. My visit takes an unexpected and phenomenal turn when Lincoln reveals he is a big Grouper fan. We come across her newest LP on the shelf beside one of her 7". As a devoted fan of Liz Harris, the two of us begin chatting, and he mentions how he gets all his Grouper records directly from Harris herself. We move on to local talent Nadja , before coming across a few Songs: Ohia 7"'s and taking a minute to mourn the recent loss of Jason Molina to alcohol poisoning. Lincoln claims he picked the Black Market as the new location due to timing and circumstance being on his side. He says he wasn't even looking to open another store, but believes music alongside retro band t-shirts will be a beneficial coexistence. He remarks how you would almost never see female customers at Vortex Records, and already today his demographic was proving to have widened immensely being inside the Black Market. Classic rock will be his top sellers - he sold off three copies of The Wall already that morning for $15 a piece - but he's hoping to become a haven for those searching for the obscure over the popular. Having only had two and a half weeks to prepare for opening, the store still looks fairly primitive. Lincoln has big plans to spruce the place up though, and it is definitely worth your time to stop in and chat music next time you go deal hunting at the Black Market. Before I leave Lincoln shows me a crate of extremely rare and odd releases, including a government-funded record of Canadian poets reading their own work. 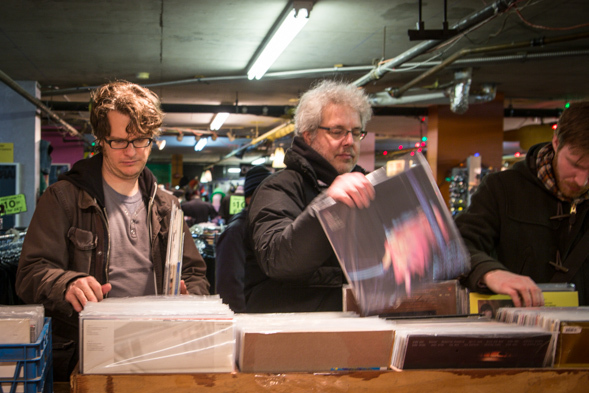 Good Music is open inside the Black Market from 12-6pm every day of the week, and Lincoln is available to buy your (good condition!) 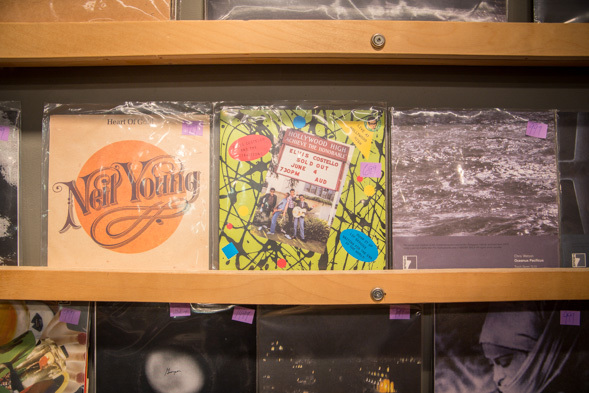 used records every Friday to Sunday, or by appointment.